A day after US, French and British missiles slammed into suspected chemical weapons sites in Syria, authorities in North Korea — its longstanding friend — held dances in the street to celebrate founder Kim Il Sung’s birthday. 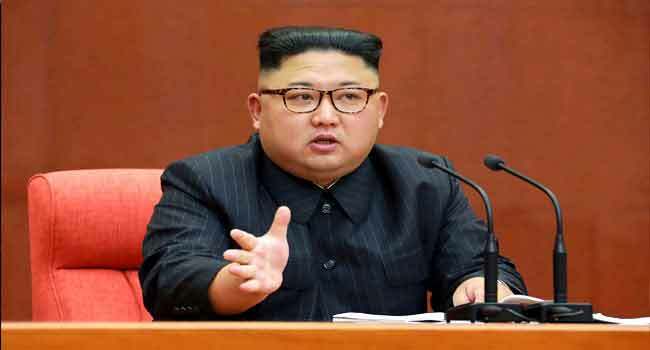 The North’s state media made no comment until Tuesday, three days after the strikes, when a line tucked away on the back page of the Rodong Sinmun newspaper merely chided the US for using the cause of “‘anti-terrorism’ as an excuse” for its actions. The token response is a notable contrast to last year when it condemned a Syria missile attack ordered by President Donald Trump as an “intolerable act of aggression” that proved “a million times over” that its own nuclear weapons programme was the right choice. At the time tensions were soaring on the back of a series of North Korean missile launches and the military operation was widely seen as a warning to Pyongyang. But now the isolated country is on a charm offensive and looking to avoid controversy in the throes of a diplomatic rapprochement on the peninsula, analysts say, with leader Kim Jong Un due to hold a summit with the South’s President Moon Jae-in next week, ahead of talks with Trump. For more than a month, the North’s KCNA news agency has barely mentioned the country’s nuclear capabilities, while its condemnations of actions by the US or the South have been couched in terms of “chilling the atmosphere for dialogue”. It has not issued its habitual vociferous denunciations of annual US-South Korea joint military exercises. Questions about North Korean relations with the US and South are off limits for visiting correspondents, as are the country’s weapons programmes — usually a safe topic as a source of national pride. “North Korea will not want to issue any statement that provokes the United States at this point,” said Kim Hyun-Wook, a professor at Korea National Diplomatic Academy in the South. The North aims “to make it difficult for the US to retreat from dialogue and go back to its hardline stance of military options and sanctions”, he added, and a diplomatic row over Syria could complicate talks between officials from both sides to set a venue, date and agenda for the summit. The North’s own domestic audience is another factor, according to Andrei Lankov of the Korea Risk Group. “Pyongyang is going to make some concessions to the US in the near future,” he told AFP. Ties between Pyongyang and Damascus go back a long way. Both diplomatic outcasts condemned by Western governments, they have consistently offered each other friendship and support. Earlier this month the ruling Workers’ Party sent its Syrian counterpart a congratulatory message saying it was “very pleased” that under Bashar al-Assad’s leadership, “the Syrian army and people have achieved great successes in the struggle to protect the sovereignty, dignity and territorial integrity of the country”. They waged a “common struggle for independence against imperialism”, it added, according to the North’s official KCNA news agency. For his part, Assad was one of only two foreign heads of state to send floral tributes to the current Kimilsungia flower show in Pyongyang, part of the North’s celebrations for the anniversary of the birth of its founder. Syria and the North both stand accused by the West of using chemical weapons — in the case of Pyongyang, in the assassination of leader Kim Jong Un’s half-brother at a Malaysian airport last year. They have longstanding arms trade ties, and a UN panel of experts has found evidence of military cooperation by North Korea to develop Syria’s chemical weapons programmes. But despite the mild response to Saturday’s strikes on Syria, analysts say they will reinforce the North’s belief that it needs nuclear weapons to defend itself from the US. Pyongyang regularly cites the fates of Saddam Hussein in Iraq — with which it was included in George W. Bush’s “Axis of Evil” — and Libya’s Moamer Kadhafi, who voluntarily gave up his nuclear programme, as evidence in its favour. A US-led coalition invaded Iraq the year after Bush coined the term, and Saddam was later hanged, while Kadhafi was ousted and killed in a NATO-backed uprising. “In North Korea’s view, even if Pyongyang denuclearised the US could still launch a strike if it wasn’t happy about something,” said Koh Yu-hwan, professor of North Korean Studies at Dongguk University.